DeForest Kelley in this 1955’s episode of the series “The Millionaire.” Not to be missed, as he a) plays a doctor! b) wears a short-sleeved smock, c) says “I’m a doctor, not a politician!” and d) probably gets the right girl in the end (after the closing). The Millionaire is an anthology series that aired on CBS Television from January 19, 1955, to June 8, 1960, originally sponsored by Colgate-Palmolive. The series explored the ways sudden and unexpected wealth changed life for better or for worse and became a five-season hit during the Golden Age of Television. It told the stories of people who were given one million dollars from a benefactor who insisted they never know him, with one exception. The series was known in syndication as If You Had a Million. The benefactor was named John Beresford Tipton, Jr. Viewers heard his voice, making observations and giving instructions; they saw only his left arm as he reached for a cashier’s check for one million dollars each week and handed it to Michael Anthony, his executive secretary. It was Anthony’s job to deliver that check to its intended recipient. The cast – Miller in 1958. Invariably, The Millionaire began with a very brief opening theme fanfare behind the ascending title frame, followed by the camera’s training directly upon Michael Anthony, played by veteran character actor and radio and television announcer Marvin Miller. 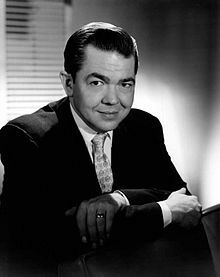 The unseen John Beresford Tipton was played by another veteran character actor and voice artist, Paul Frees. Miller was the only cast member who was seen in every episode. 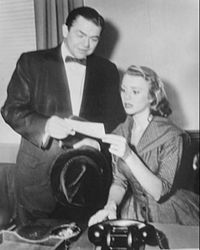 The most regular recurring supporting actors were Roy Gordon, as banker Andrew V. McMahon, on whose Gotham Trust Bank the anonymous Tipton’s cashier’s checks were drawn; and Ed Herlihy, as the announcer for The Millionaire. Following the commercial break, Anthony, back in the present and behind his desk, would introduce the week’s millionaire. 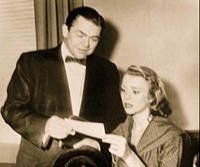 After showing the beneficiary in a typical situation for few minutes at the beginning of the episode, Anthony would arrive, deliver the check, and have the beneficiary sign a legal statement binding him or her never to reveal the source of this million-dollar gift except to a spouse (if the recipient was single, Anthony would add, “… should you marry”), under penalty of forfeit. Once the document was signed and the thanks were given, Anthony disappeared from the beneficiary’s life forever. The remainder of the episode showed how the gift affected the beneficiary. The beneficiaries were not always poor but could be from any social class or occupation, from secretaries and construction workers to professionals like doctors and lawyers. Nor were they always likely to find their lives changed for the better because of their sudden wealth. Tipton did meet one beneficiary, a man condemned to be executed for a crime he never committed. He used a portion of his million-dollar gift to prove his innocence, with direct help from Michael Anthony, the only time Anthony stayed in even the periphery of a beneficiary’s life. Tipton visited the man as he was about to leave prison, though he was shown in his customary position: from behind, only his hand or arm and a brief glimpse of the top of his head in view. The only other time Tipton was seen in any episode, beyond presenting Anthony with the next check to deliver, was one in which Anthony was arrested and needed Tipton to bail him out to finish the mission. In another episode, Anthony said that the beneficiary “got the money, all right … but not from me.” Anthony was on his way to deliver the check when he was run down in a street accident, and the check was jarred loose from his possession. It made its way around a few stunned townspeople before it finally reached its rightful owner, offering a short study of those people’s reactions to instant wealth as well as the intended recipient’s. The Millionaire ceased regular series production in 1960, its final regular episode, “Millionaire Patricia Collins,” airing June 7, 1960, and its final summer reruns in its regular production time slot appearing that September. The show became a familiar presence in syndicated reruns from the 1960s through the 1980s, both on its original network, CBS, and on numerous regional independent stations. In 1999, the TV Land cable channel aired a few selected episodes. The show was never officially released on home video. Creator and producer Don Fedderson later produced a TV movie version of The Millionaire with Martin Balsam as Arthur Haines and Robert Quarry as Michael Anthony. The movie was intended as a backdoor pilot for a revival series, which never occurred. Since each episode featured a different beneficiary, numerous guest stars appeared during The Millionaire’s production, including Charles Bronson, Dennis Hopper, Jack Lord, Nora Marlowe, Joyce Meadows, Martin Milner, Angie Dickinson, Robert Vaughn, Mary Tyler Moore, Agnes Moorehead, Rita Moreno, Aaron Spelling, and Betty White. At least two professional athletes appeared on the show: basketball and baseball player Chuck Connors (who also had a career as an actor) and Hall of Fame baseball pitcher Don Drysdale.